Thanks to a new partnership between Newcastle Airport’s retail facilities and renowned Hunter bakery Snows Artisan Bakers, there is a whole new range of hand-finished, delicious foods available across our cafes. Ranging from health-conscious meals to indulgent treats, there is something for all tastes. * Here are just a few of the new offerings available now from Valley & Vine, Hunter & King Coffee Co, and Cibo Café. Start your day (and your trip) with one of the trendiest breakfast foods of the moment - the Avocado Smash. 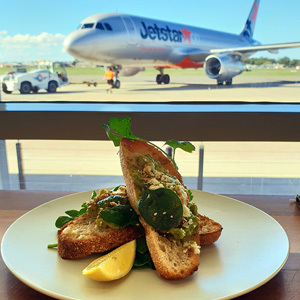 Served over Snows all-natural and preservative-free fresh bread, our smashed avocado is topped with spinach, crumbled feta cheese, dukkha, and lemon, putting quite the ‘Valley & Vine’ twist on an Aussie favourite. This is a just a selection of the new Snows crafted delights on offer - you can also look forward to picking up other goodies such as sausage rolls, caramel slice, and more. * Come on in to any café across the Newcastle Airport Departures and Arrival and try them out for yourself! * Please note: All products may contain traces of nuts, eggs, dairy, and/or gluten. Product availability subject to change.